SCVHistory.com | People | Bobbie Trueblood's Old Newhall Memories, by Ruth Newhall. Bobbie Trueblood's Old Newhall Memories. She was at the cener of the social scene in Santa Clarita for half a century. Now, Bobbie Trueblood Davis recounts a bit of history. By Ruth Newhall, Gazette Correspondent. 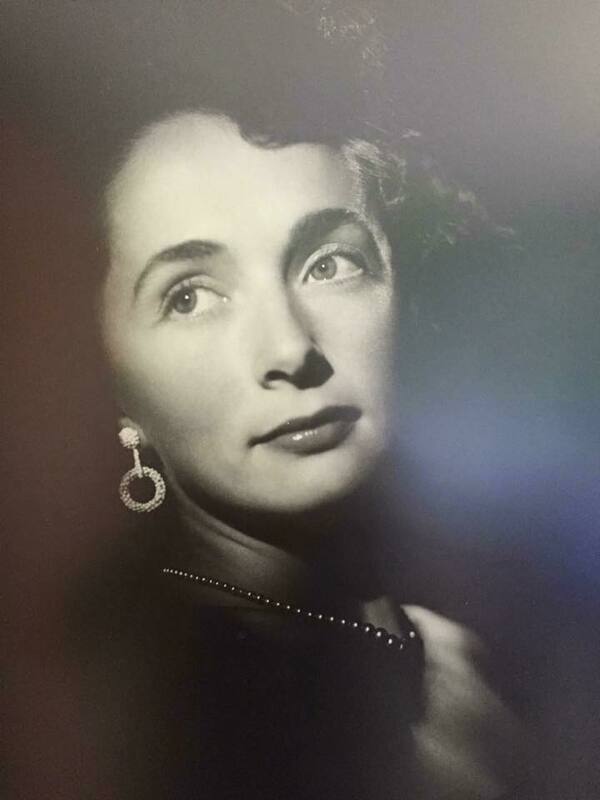 By the time Scott Newhall bought The Signal newspaper in 1963 and hired Bobbie Trueblood to cover society affairs, Bobbie was already well known as the SCV's "Mrs. Republican." | Click image to enlarge. An exhausted 21-year-old Aileen "Bobbie" Nash and her fiancé stopped for breakfast at MacDougall's cafe on the long hill leading to Newhall Pass. It was just before sunrise on June 19, 1946. At that hour she was surprised to see the roadside cafe full of young people, almost her own age. Her fiancé explained that the previous night the first postwar senior ball had been celebrated by San Fernando High, where the young people of Newhall and Saugus went to school. They were now on their way home from the all-night celebration. For Bobbie this was the last leg of a long and harrowing trip from her home in Exeter, a venerable cathedral town near the English Channel, whose antiquities had suffered from German bombs. Two years earlier she had reached draft age and was assigned to do factory duty in Bath, some eighty miles to the north. It was there that she met Yank soldiers in the canteen. She was courted by Fred Trueblood Jr., the son of the owner-editor of a newspaper called the Newhall Signal, in a small California town. They planned to marry after the war, and now, thirteen months after the German surrender, she embarked on the long trip to a new life. When she landed in New York she found a madhouse at the airport. The Joe Louis-Billy Conn fight the previous night had drawn spectators from everywhere, and they were all trying to get out of New York. "I thought I was going to be trampled," she said later. "I had to fight my way to the plane. Everybody was pushing and grabbing. I somehow made it. And then we changed planes in Chicago, then in Omaha and again in Denver. We flew between snowy peaks, and everyone was sick and throwing up into their little brown bags. When we got to Burbank, which was then Los Angeles International Airport, it was totally fogged in. We circled and circled and finally landed, and Fred was there waiting." After MacDougall's cafe, the couple headed for Fred's parents' house. It was a rented house on the sprawling estate of cowboy actor William S. Hart. Although her British passport identified her as Aileen Nash, Bobbie had never used that first name. Her father, an ardent sportsman and cricketer, had been sure his firstborn would be a boy, so he promised to name the baby after his teammate Robert Newman. On the day of the baby's birth, Newman informed his friends that he was going to the hospital "to see little Bobbie." The name stuck. "Aileen" materialized only on wartime I.D. cards and a passport. July 10, 1946 was the wedding date. A week earlier, Newhall celebrated its annual Fourth of July parade. Fred told Bobbie that she must wear Levis, which she had never seen. She borrowed a pair from Fred's brother — "the most uncomfortable thing I've ever worn!" It was the first and last time she ever donned jeans. Bobbie was surprised at the size of the small town but enchanted with its friendly people. Her wedding cake was baked by "Auntie" Pearl Russell (née Pardee), who lived in her family's small house on the triangle made by Newhall Avenue, Walnut and Eighth Street. The house later served variously as a telephone exchange, Chamber of Commerce office, and the first Boys Club. It was Bobbie's first contact with the American West. For the Fourth of July a "hoosegow" was erected on Spruce Street — Newhall's main street — in front of Clymore Ford, just below Sixth Street. Any man who failed to grow whiskers for the Glorious Fourth was clapped into the hoosegow and sprayed with soda water by passing youths. Bobbie and Fred were married at St. David's Episcopal Church in North Hollywood. Sometime later Bobbie and five of her friends agreed that there should be an Episcopal church in Newhall. They found they would first have to establish a mission, and then it could grow into a church. "Judy Stevens and I were talking it over and looking for a name for the mission. Trouble was, the Los Angeles area had so many churches, it was hard to find a name that wasn't taken. "So I looked at Judy and said, 'How about your name? Change the spelling from Stevens to Stephen's?' And that's how we got St. Stephen's Church. "There was only one thing we didn't realize: St. Stephen's Day is the day after Christmas, so we had to celebrate all these holidays in a row!" "Newhall was a town of ranchers, horses and cattle," Bobbie recalls. "Newhall's Andy Jauregui furnished the cattle for Sheriff Biscailuz's annual downtown rodeo, a major Los Angeles event, and there were many lesser rodeos held during the warm months at Bonelli stadium in Saugus. Andy Jauregui's brother doubled for John Wayne. He, Hoot Gibson and other western stars made this area the center of activity, and several of them, like Bill Hart, had ranches here." Housewives did their marketing on Spruce Street, between Market and Seventh Streets, at the M & N (Mike and Nell) Market. Johnny, Mike and Nell's brother, was a practical joker. One day he passed the word around town that the telephone company was going to "blow their lines" so everyone should cover their telephones. Most people did. Another joke was to hook up the chain on the market's toilet — the town's only public restroom — to a police siren. When a very pregnant Bobbie Trueblood became the victim of the blasting horn, the embarrassed perpetrators halted their pranks. In the 1950s, the town awoke one morning to find that the familiar "Spruce Street" signs were gone and had been replaced by signs saying "San Fernando Road." Fury raged through Newhall. It was bad enough to have the street name changed without so much as a by-your-leave to businesses or to the residents. To have it replaced by the name of the despised rival community over the hill was hardly believable. Newhall citizens signed petitions and trekked to the County Board of Supervisors' meeting in downtown Los Angeles to voice their protests. It was no use. The Supervisors ignored them. Spruce Street vanished, except for a tiny block-long remnant below Lyons Avenue. 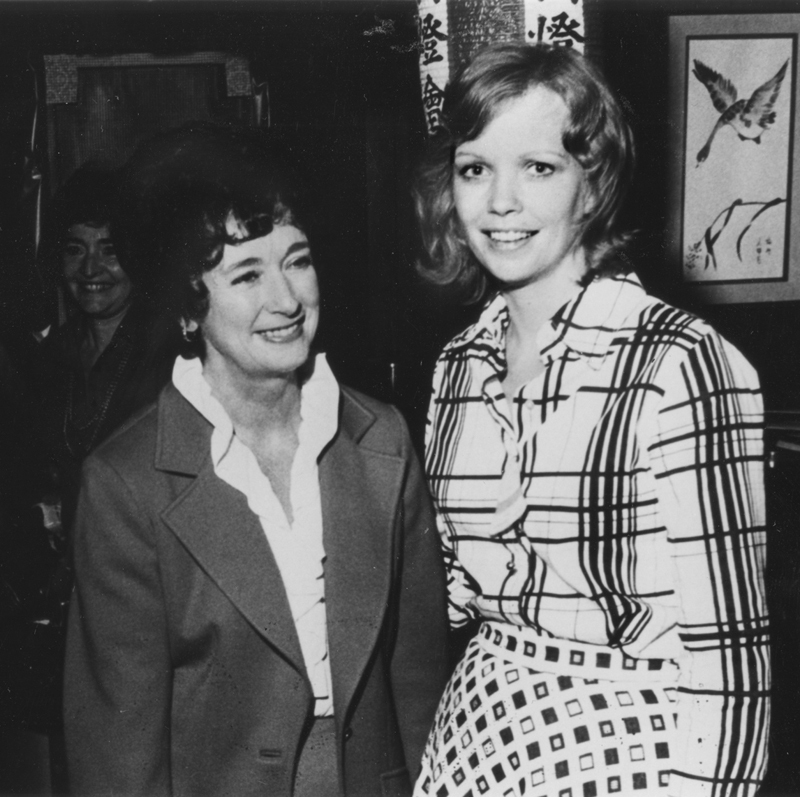 Bobbie in the 1970s with Maureen Reagan, daughter of Ronald Reagan and Jane Wyman. | Click image to enlarge. When Bobbie arrived, telephone calls were still handled by operators. If you called 267-W, the operator might say, "Oh, they're not home now. She's over at the Perkins'." Later, dial phones came in, but for a while people shared 8-party lines — making it easy, Bobbie says, to pick up gossip. Bobbie and Fred moved into the last of the 25 new homes being built by the Bonelli family on what was then called Dry Canyon Road (later changed to Seco Canyon Road on the possible theory that "Dry" sounded better translated into Spanish). These were the first tract homes to be built in the valley. The Bonellis wanted a name for their tract, and they turned to local historian A.B. Perkins for ideas. Since the early Spanish explorers had given the name "Santa Clara" to two different rivers, the southern one through Newhall and the northern through San Jose and Santa Clara, people had taken to calling this often-dry river "Little Santa Clara." Perkins suggested that they translate Little Santa Clara literally to "Santa Clarita." It was the first time the name was used. The tract was duly christened "Santa Clarita" — but no one ever used the name. It was simply known as the Bonelli Tract. It was some years before "Santa Clarita" surfaced again, but that is another story. 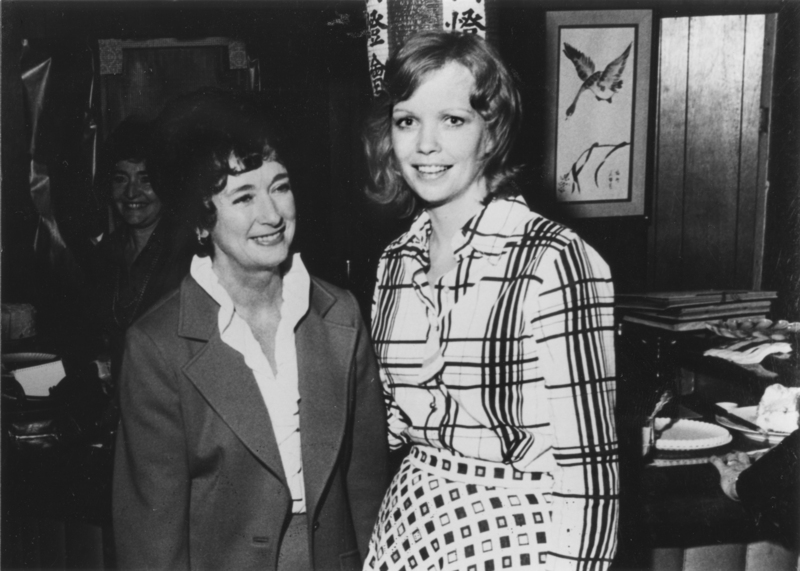 Bobbie Trueblood (left), Dolly Reynolds and Flo Chesebrough post for a photo to promote the second annual SCV Boys & Girls Club Auction in 1973. The first of Bobbie and Fred's four children was three years old when Bobbie's mother came from England for a visit, and Bobbie delighted in showing her the July Fourth antics. By that time Bobbie had taken lessons in American speech, so their children would not embarrass themselves by saying toMAHto instead of toMAYto. Bobbie was one of the first enrollees in the new citizenship class at Hart High adult school and in 1952 became the first graduate of that class to become an American citizen. Her first act as a citizen was to rush to Auntie Pearl Russell and register to vote. She registered as a Republican, though at that time her in-laws were Democrats, because, she said, in England her family had always been Conservatives, and she would not dream of joining a "Labour" party. Bobbie stood at the center of the local social scene. When her sister-in-law became pregnant and gave up writing a social column for the Signal, the Truebloods' paper, Bobbie took over the job. She was the first female "Man of the Year" chosen by the Boys' Club, of which she was the first female president. 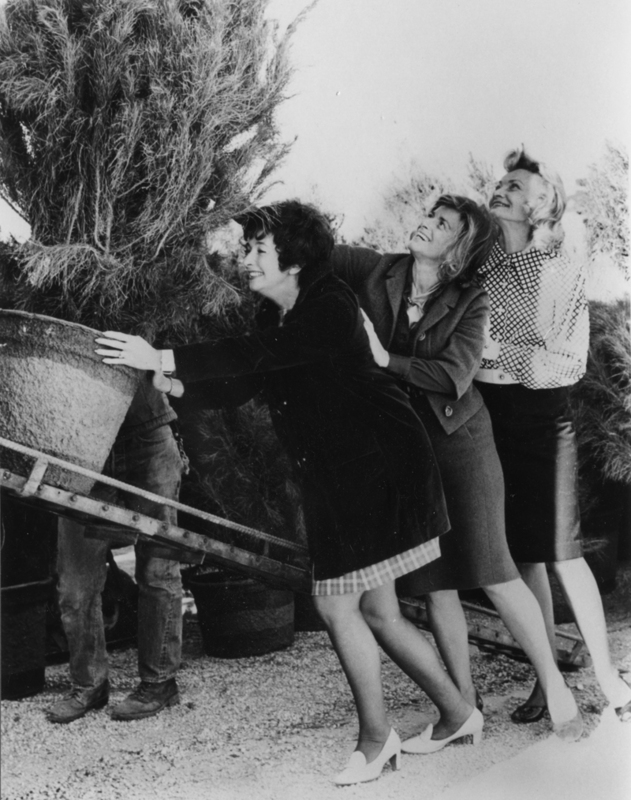 To emphasize the point that there was nothing manly about Bobbie, the Newhall-Saugus Chamber of Commerce later named her Woman of the Year. She was the one who presided over the opening meeting, in 1975, of the newly-formed Santa Clarita Valley Historical Society. Bobbie's father-in-law Fred Trueblood died in 1960. After about a year, the expanding family — Fred Sr. had two boys and two girls — decided they no longer wanted the paper, and sold it. 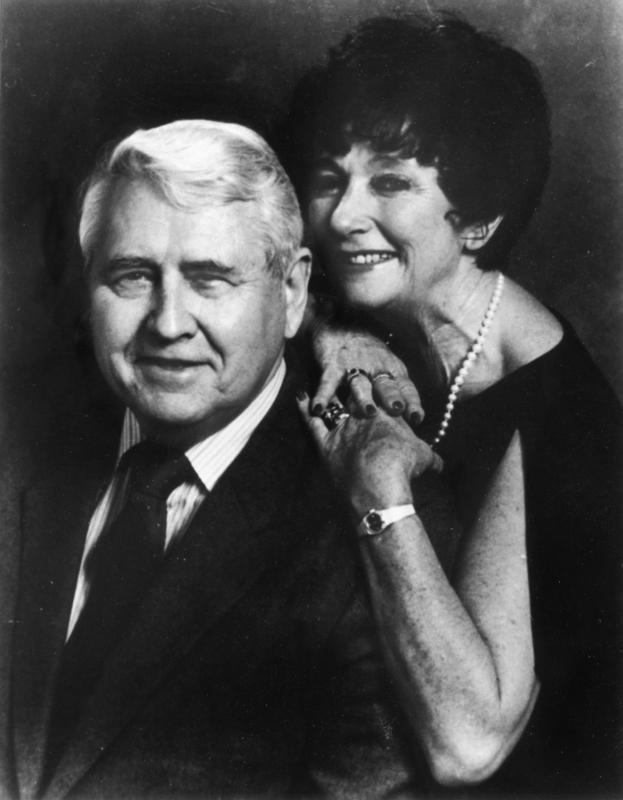 When Scott Newhall bought the paper in 1963, he hired Bobbie once more to write about social events. In this Republican community she was "Mrs. Republican." She continued bravely working for the paper until Newhall's attacks on her favorite politicians became too venomous to overlook. Bobbie and Ed Davis. | Click image to enlarge. A memorable Fourth of July has gone down in history as "Bobbie's Parade." In 1973, the 51st anniversary of the Newhall parade, the Chamber of Commerce, busy reorganizing, said they had no time for a parade. Bobbie and Scott Newhall (who remained friends) held out for the traditional parade. The Signal announced that Bobbie would star in a parade of her own. Bobbie's Parade, as it was thereafter known, marched the length of San Fernando Road from Lyons Avenue to Hart Park. A couple of horns tootled; a harmonica played; a drum banged; dogs (on leashes) and children (unleashed) frolicked alongside the adults. Scott Newhall, on crutches with his wooden leg removed, sweated the length of the journey in his too-tight World War II correspondent's uniform. But the centerpiece was Bobbie, in a flowing white dress, carried on high on a litter borne by six volunteer Rotarians and waving, on a single staff, the Stars and Stripes and England's Union Jack — a pairing which would have confounded our Founding Fathers. Fred Trueblood Jr. died twenty years ago. Bobbie became the first employee of the Henry Mayo Newhall Memorial Hospital, assigned to spread the word about the not-yet-existent hospital around the community and help organize support groups. 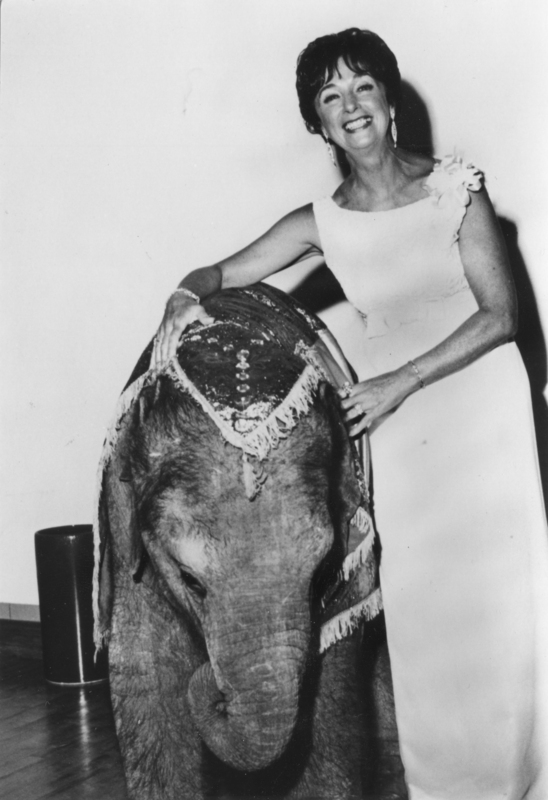 At times she served as local representative for various Republicans, including then- Assemblyman Newt Russell and State Senator (later Lieutenant Governor) Ed Reinecke. She participated in widespread community activities and Republican events. In the election of 1980 she served on the campaign staff of Assemblyman Bob Cline, who was competing for a State Senate seat against former Los Angeles Police Chief Ed Davis, among others. Bob lost; Ed won. As Ed looked for a full-time staff, someone suggested that Mrs. Republican of Newhall, who knew everybody in town, might be the right person. He hired her in January 1981. In January 1984, they were married. On July 4, 1995 Bobbie Davis was co-Grand Marshal (with this writer) of her fiftieth consecutive Fourth of July Parade in Newhall, while Bobbie's husband, the Senator who embraced retirement after three terms and whom she identifies as "the love of my life," drove the car. It was more comfortable than being carried in a litter, but maybe not quite so much fun. ©1996 SCVTV | Old Town Newhall USA.